Book and manage your corporate travel quickly and simply with i:Mo: the online travel management tool that fits your organization. i:Mo is a travel management tool that we make available to our clients. i:Mo Free is a free portal that simplifies the online booking of your corporate travel. By using i:Mo Free, you benefit from reduced ticket fees and you can make use of the accompanying Mobile Companion app. We also provide you with the 24-hour service from Munckhof which offers many advantages over booking tickets or hotels through internet-based suppliers. Read more about the Mobile Companion app. If you need to know at any given time where in the world your travellers are located, then choose i:Mo Free + Connect or i:Mo Free + Comfort Connect. 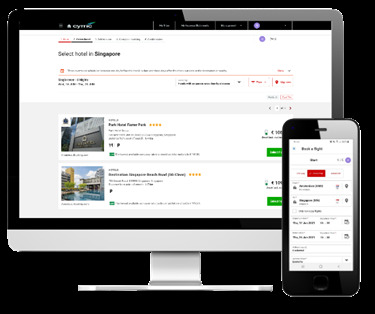 The added advantage of these extended portals is that we are able to integrate all your online and offline reservations in one convenient location. This means that you always have a complete overview of all your bookings; whether you made the booking yourself in i:Mo or through one of our experienced Travel Consultants. In addition to i:Mo, we also have the extended customized packages i:Mo Business and i:Mo Enterprise. These packages come with an extensive range of possibilities relating to travel policy, your own contract agreements and travel authorization. The packages can be designed in accordance with your corporate identity. The extensive options for expense management are the distinguishing factors of both packages. Finalizing the administrative processes for corporate travel within your organizations are made significantly more efficient by these options. If you are interested in finding out more about i:Mo, we would be happy to consult with you to select the perfect package for your organization. Would you like to have quick and free access to i:Mo Free? Please fill out the form below or call us at +31 77 3204281.